St. Anthony’s Orthodox Church Hyderabad-Sindh, Pakistan. 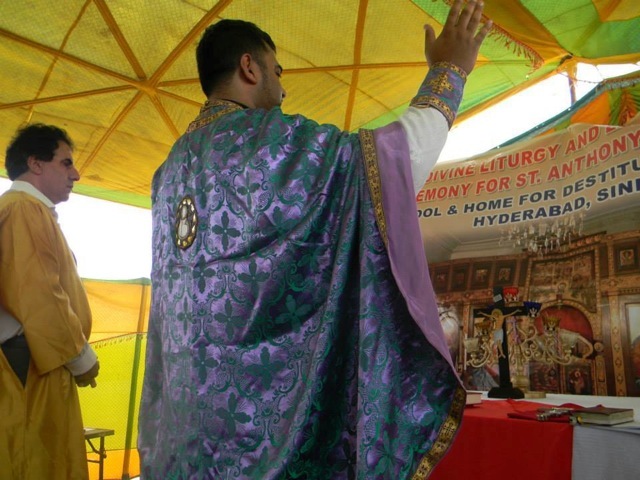 On 18, August 2013, (8th Sunday after Pentecost) with the blessing of His Eminence Metropolitan HILARION, Archbishop of Eastern America and New Your, First Hierarch of the Russian Orthodox Church Outside of Russia, three historical events took place at St. Anthony’s Orthodox Church Hyderabad-Sindh, (A Russian Orthodox Parish in Southern Province of Pakistan). Rev. Fr. 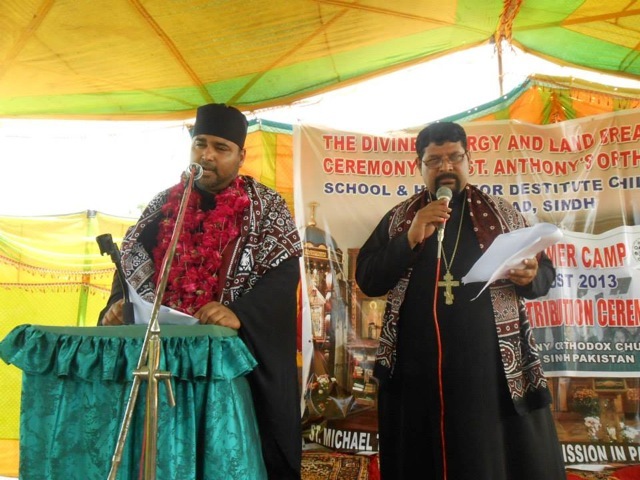 Adrian Augustus Dean and Director of St. Michael the Archangel Orthodox Mission in Pakistan, traveled from Australia to Pakistan to honor the ceremony, and he served as a master of ceremonies. The clergy of the Russian Orthodox Church in Pakistan witnessed this historic occasion. 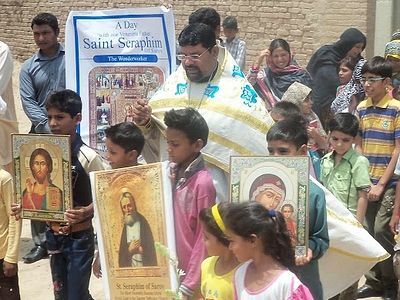 It was a lifetime opportunity for our entire Orthodox community to come together in celebration of the beginning of the Church founded by our Savior, spread far and wide by His apostles and their successors, and which now has reached the people of Pakistan. The host of this event was Rev Fr. 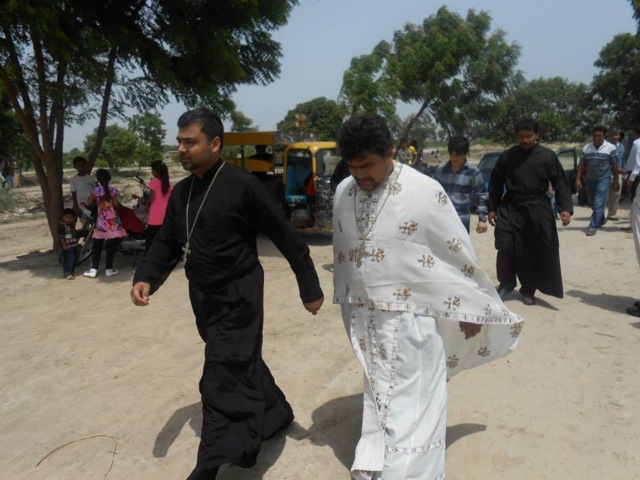 Anthony Masih, Rector of St. Anthony’s Orthodox Church, Hyderabad, Sindh. Pakistan is an Islamic State where extremists are very powerful. Christian minorities are not safe among them. The community is extremely poor and deprived of basic human rights. The clergy of the Russian Orthodox Church outside Russia always stand by them through thick and thin, and in the Orthodox Church in Pakistan’s fight for minority rights on different forums. Since the creation of Pakistan, our community has faced many persecutions, and there are many incidents of religious bigotry and violence among the oppressed Christian minority in Pakistan. The Government of Pakistan and law enforcement agencies have failed to control the extremists groups. We trust in our Lord Jesus Christ, and these worries, problems, antagonistic forces, and lack of financial sources will never stop us from carrying out this mission, because our strong faith and hope give us reason to continue, and the courage to move ahead. The Russian Orthodox Church outside Russia (ROCOR) is firmly established in Pakistan. 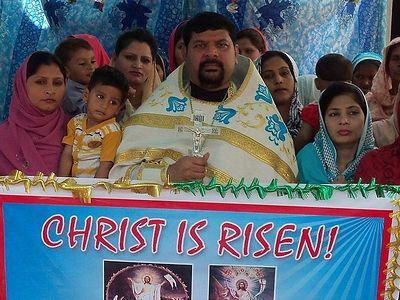 Our Orthodox mission in Pakistan is indeed going well under the guidance of the Holy Spirit and the Most Holy Theotokos. The Divine Liturgy was celebrated in makeshift tents, and over 300 Orthodox faithful attended. Fr. Adrian led the Liturgy along with Fr. Anthony, Fr. Cyril and Fr. Joseph. 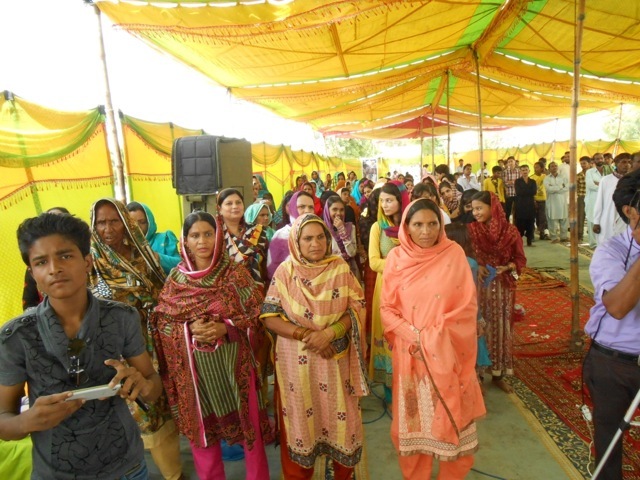 The over 300 people present were prayerful, and it was a good mix of younger and older people. After the Divine Liturgy, the anticipated moment of ground-breaking began with a prayer by Rev.Fr. Adrian. Fr. 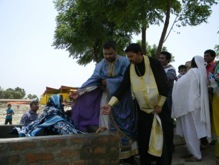 Adrian went around to bless the ground, accompanied by the clergy of the Russian Orthodox Church in Pakistan and parishioners of St. Anthony’s Orthodox Church. 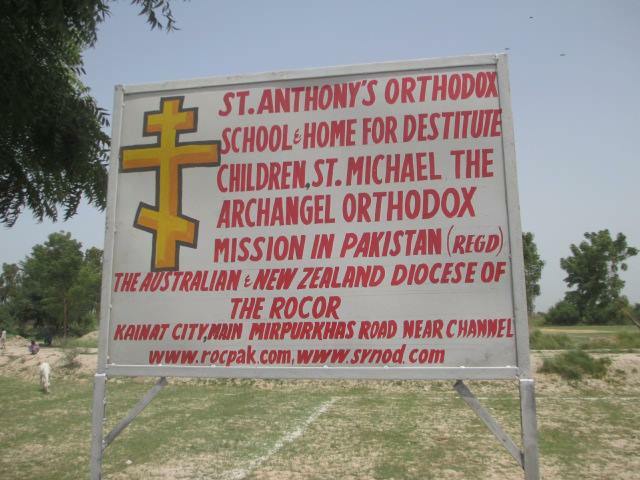 The Orthodox Mission in Pakistan wishes to construct a home for destitute children and prayer hall for Divine Liturgy. For the solid foundation, we pray that the spirit of faith and love guide and lead us. It is imperative to make the donor feel that he or she is a partner in fulfilling our Orthodox Mission in Pakistan. Seventeen people embraced Orthodox faith, and they were baptized and chrismated. The new members had the blessed opportunity to receive the Body and Blood of Christ. God is sending us people who are seeking the truth of Orthodox Christianity. 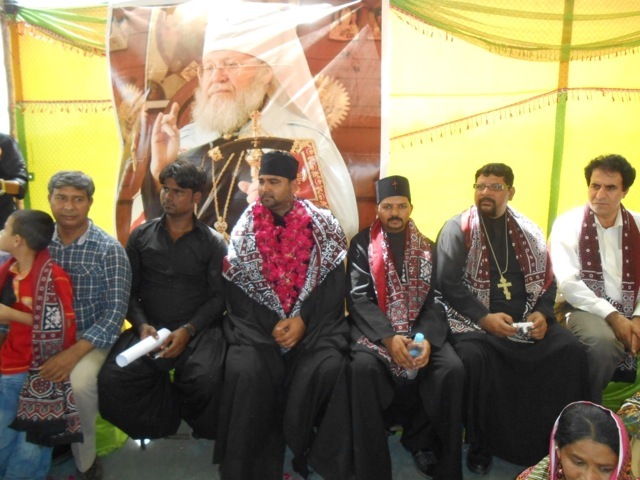 A cultural program was held by a youth group of St. Anthony’s Orthodox Church Hyderabad-Sindh. It is worth mentioning that during summer holidays, Fr. Anthony and his Matushka Maria Anthony arranged a youth camp for Christian students. Sixty-five students participated in the youth summer camp. The following activities and lessons were taught to the students: English language, Personality Development, and Career Guidance, but the most important lesson plan was “Teaching Orthodoxy”: 1) History of the Russian Orthodox Church; 2) Orthodox Prayer; 3) The Divine Liturgy; and 4) the Lives and works of Orthodox Saints. At the end, all the participants were awarded with certificates by Rev. Fr. Adrian. 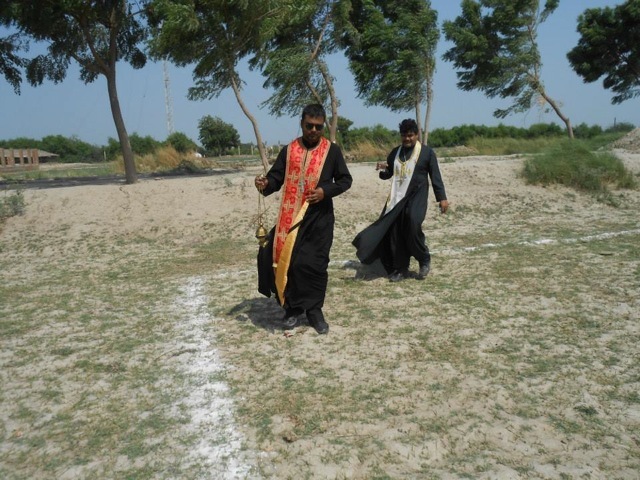 Although St. Michael the Archangel Orthodox Mission in Pakistan has a scarcity of financial sources, the clergy work and preach the Orthodox faith with total commitment and dedication. They feel full satisfaction and joy in their pastoral work. We are hopeful and trust in God that with help of the International Orthodox community, our Church will rise and shine like a galaxy. The translated (in Urdu language) Orthodox Prayer Book and Divine Liturgy of St. John Chrysostom were formally inaugurated at the Hyderabad Press Club on September 26, 2013 by Rev. Fr. Adrian. Fr. 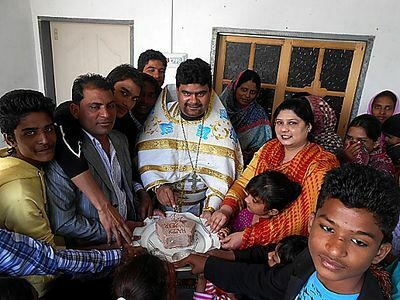 Adrian was then interviewed by the Pakistani National Press Service, social workers and Orthodox faithful present on the occasion. The whole event was given coverage by the press and was presented on the national news.